* String or ribbon, etc. 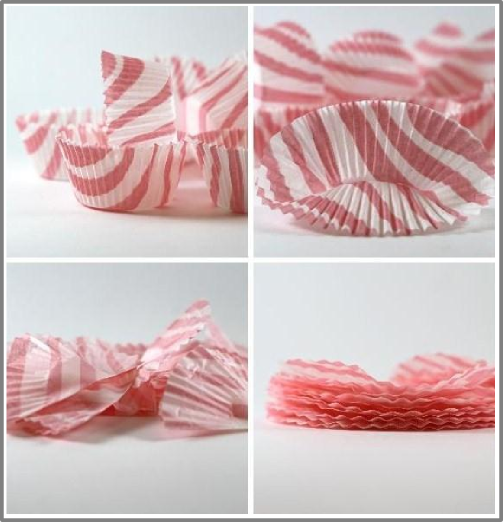 Separate out 10 liners and fold them in half with the right sides together. Once liners are folded take your glue stick and glue them together, one on top of the other. Once glued, put your groups of 5 in some books for a few minutes till the glue sets and this will also make the liners flatter – remember doing this with petals as a child? Once they're set, glue your groups of 5 together to make your final pom pom's of 10 and put them back in the books to set. 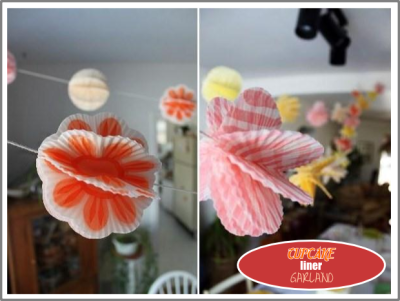 These Cupcake Liner Pom Pom’s don’t just stop at horizontal garlands; you could use them as place card holders, vertical garlands strung up behind your dessert table or use a skewer/lollipop stick, glue it in the centre of the pom pom, and you've got a pom pom on a stick that can be cupcake toppers, table decorations and much more!